How were the seeds figured out you ask? Math! We looked up the average rating of each best picture nominee on the online movie social network service Letterboxd. These ratings were than averaged together to get one rating for each year. For instance, 1994 received a 3.98 because that was the average between Forrest Gump (4.1), Four Weddings and a Funeral (3.3), Pulp Fiction (4.4), Quiz Show (3.7) and The Shawshank Redemption (4.4). If there was any ties in these yearly averages each film’s domestic box office was averaged together for the year. Whatever year had the higher total average between the two took the higher seed. (Box office totals could not be just added together because after 2009 there was more than five best picture nominees). Voting for each round will close on Wednesday night and the next round of match-ups will begin on Thursdays. 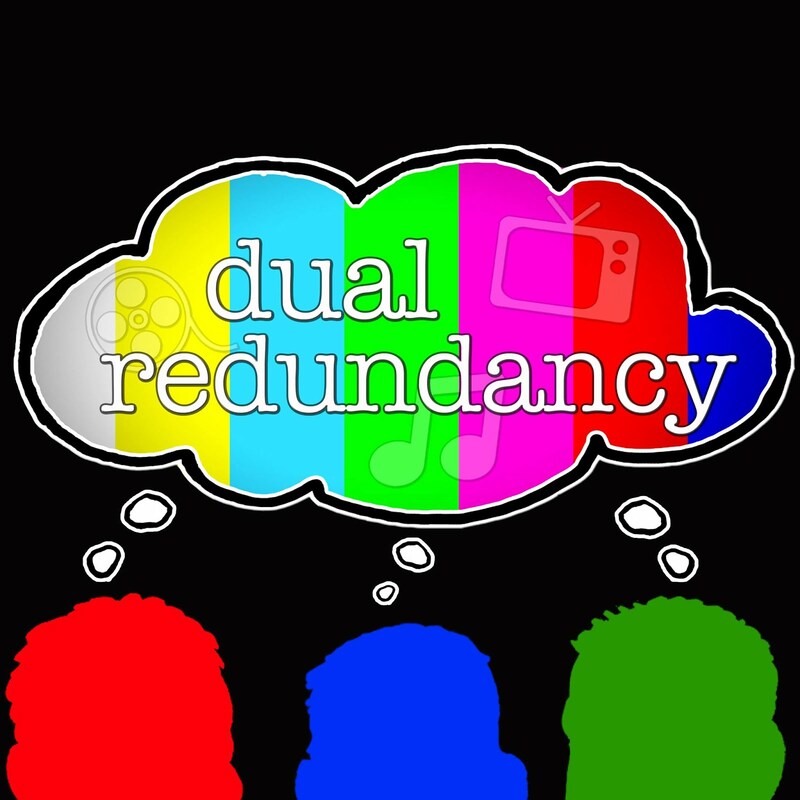 Keep an eye on the blog, our Twitter feed and each episode’s show notes for the voting link! 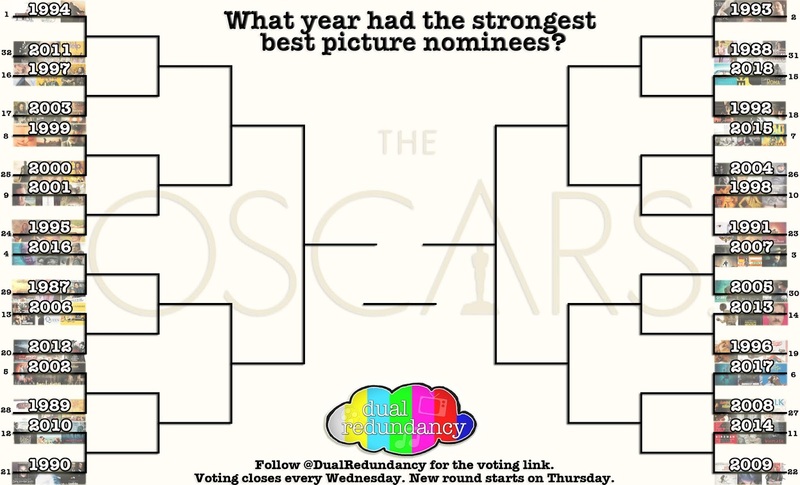 Speaking of voting ROUND ONE HAS BEGUN! Please only one vote per person. In this week's episode David, John and Kyle discuss the results from the Writers Guild Awards and how that will effect the Oscars (2:05). We also discuss The Academy’s decision to reveal four Oscar winners during the commercial breaks (and then the swift reversal of this decision) (9:10). 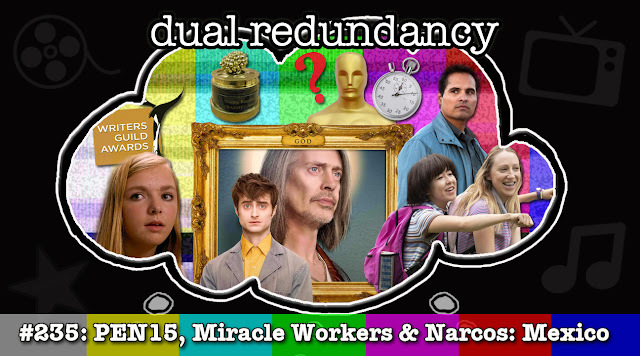 Next we discuss the claim that the Golden Raspberry Awards are fake (20:40). Finally, we review the series premieres of Hulu’s PEN15 (25:05) and TBS’ Miracle Workers (32:10) before Kyle gives us a mini-review of the first season of Narcos: Mexico (39:45). 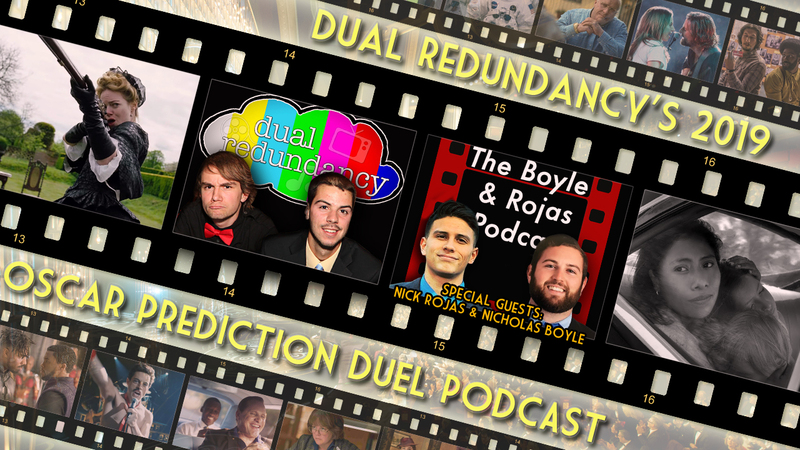 After predicting the top eight awards for the 91st Academy Awards, David and Kyle are joined again by Nicholas Boyle & Nick Rojas of The Boyle and Rojas Podcast. 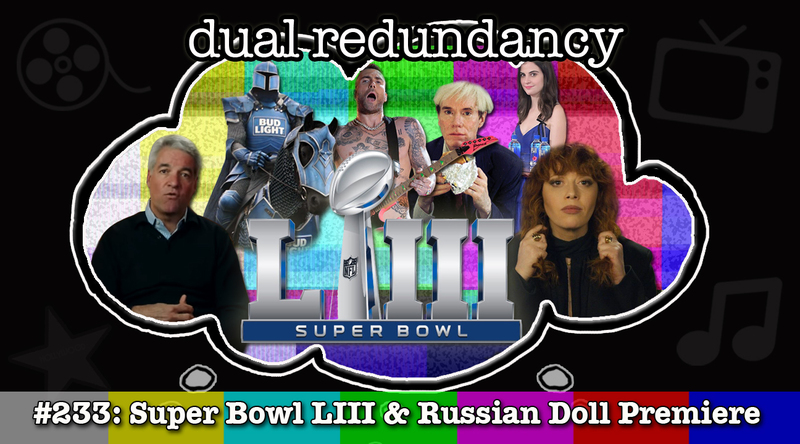 In this special mini-episode they try and predict two other categories that could have some unique winners at the Academy Awards on Sunday. 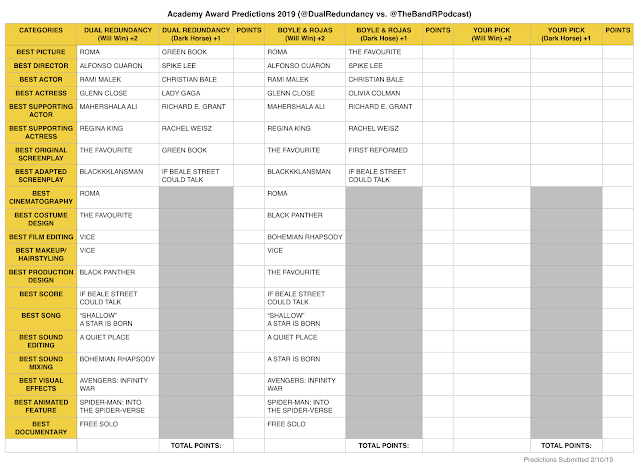 This episode was originally recorded on February 12th before The Academy reversed their plans of not showing all the categories live. 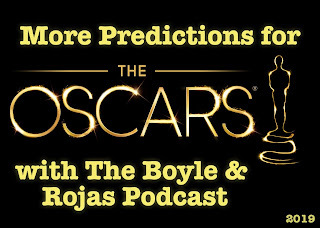 For even more Oscar predictions be sure to check out our main Oscar prediction special. You can also listen to past episodes of the podcast on iTunes, YouTube and our new Twitch channel! In this week’s episode David and Kyle take on special guests Nicholas Boyle & Nick Rojas of The Boyle and Rojas Podcast in predicting the very unpredictable Oscars. 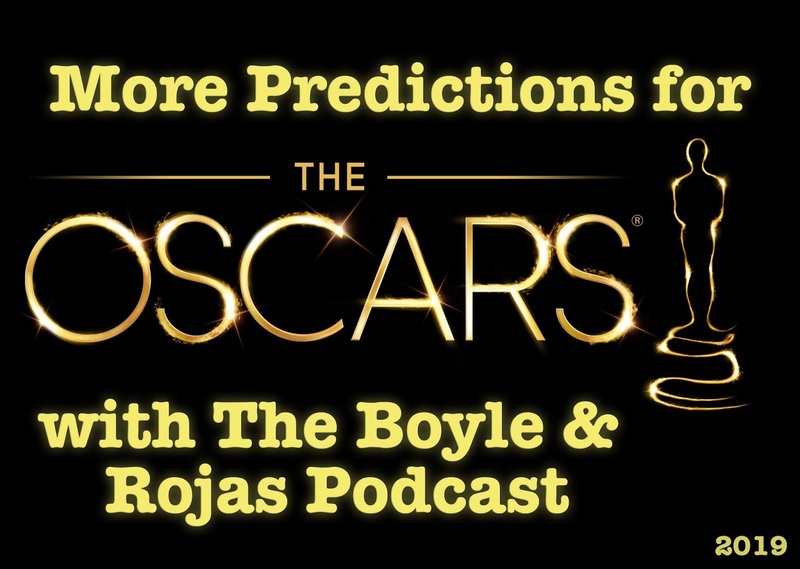 In this special episode they try and forecast who will take home the Oscar in all the major categories for the 91st Academy Awards. We discuss (in order) best adapted screenplay (7:00), best original screenplay (11:15), best supporting actress (16:55), best supporting actor (20:55), best actress (25:10), best actor (30:10), best director (37:15), and best picture (43:05). Want even more Oscars? We discussed a few more Oscar categories and have a nomination reaction podcast! You can also listen to past episodes of the podcast on iTunes, YouTube and our new Twitch channel!